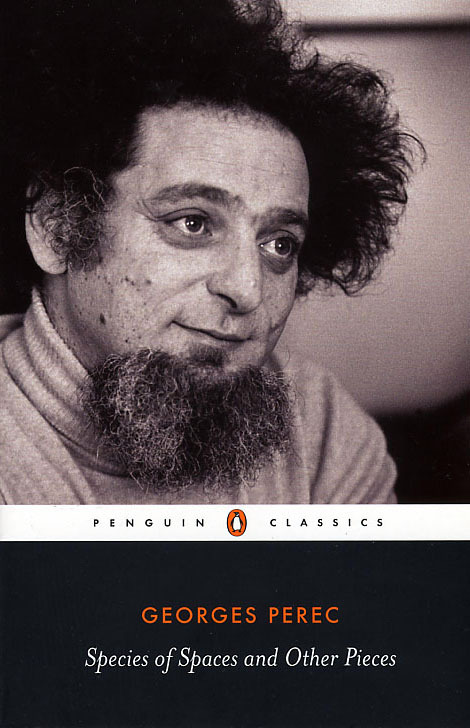 Too few people know the work of French writer, Georges Perec (1936 – 1982), whom Italo Calvino once described as ‘one of the most significant literary personalities in the world.’ Perec concentrated on linguistic games and excursions, writing a 300 page novel without using the letter ‘e’, which in French was called La Disparition, the English title artfully called A Void. Perec’s playfulness disguised a grim upbringing. Born in Paris in 1936, the son of Polish Jews, his father was killed in the war in 1940, and his mother deported to Auschwitz in 1943. His most famous, prize-winning novel was Life: A User’s Manual (1978). In 1974, he published a collection of essays about space – public and domestic, indoors and outdoors – called Species of Spaces, full of idiosyncratic insights into the relationship between people and places, and how each shapes the other. It is a marvellous book to dip into, even if it veers from the joyful and serendipitous, to the arcane and appalling. It was in the 1997 Penguin edition that I first came across his account of the landscape programme and planting schedule for Auschwitz itself, a document truly shocking in its mundane specifications for particular plants and trees for different areas of the camp, all ordered from the regional depot of the Department of Agricultural Services. Few writers have been so attuned to the mood-changing properties of designed or accreted landscapes and architectural settings. What Perec loved were public parks, rooms filled with personal clutter, street trees, neighbourhood shops, the lettering on café windows, canals, signposts and maps, cats and dogs, circular walks around town preferably crossing bridges only once on each outing, irregular staircases, rooming houses and street corners. He was clearly influenced by two other seminal French works on the nature of space in the post-war era: Gaston Bachelard’s The Poetics of Space (1958) and Henri Lefebvre’s The Production of Space (1974). With the exception of William H.Whyte, Jane Jacobs and a few others, it is only in recent years that mainstream Anglo-American writing on architecture and landscape has come to terms with a more personal or phenomenological approach to the endless fluidity of space in everyday life. You can never step into the same space twice, Perec might have said, only too aware of how time of day, weather, and the theatre of human life, constantly changed the smallest of streets or public squares. In one essay he describes revisiting the same street where he grew up, Rue Vilin, on four occasions over a period of five years of slow decline: on each occasion it was quite changed in every aspect. Yet even today a functionalist, Euclidean approach to the planning of public spaces, buildings and their interiors is still dominant in British towns and cities, invariably on the basis that if it looks good and works on the drawing board and in the digital simulation, then it must work in real life. (The less said about ‘artist’s impressions’ or computer generated images of proposed developments and their shiny, happy people, the better). For Perec the problem with utopian aesthetics was that ‘there is always some great taxonomic design: a place for each thing and each thing in its place.’ Too many boxes and straight lines. Ken will be talking about Perec on Sunday, 21 September 2014 (4pm – 7.30pm) in the gardens of The Old Rectory, 365 Mare Street, Hackney, London E8 as part of an afternoon of performances commemorating another lost space in Hackney. This event is FREE but you must register via http://www.digcollective.co.uk (where you can find lots more details about the event).